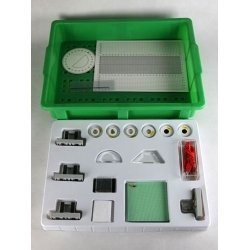 A comprehensive optics lab kit. 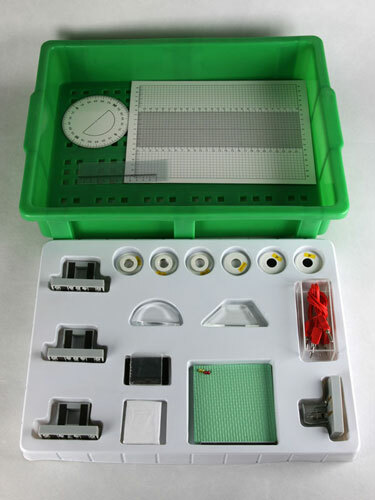 The set is used for studying optical phenomena, determination at a quantitative level of laws of light reflection and refraction, formation of the practical skills necessary for work with elements of optical schemes, for installation and adjustment of optical device models. 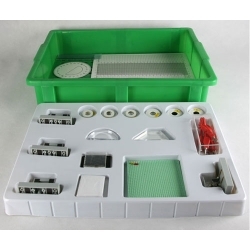 The set is used for carrying out laboratory and practical works, at the organization of pupil research works in lessons of physics in conditions of the basic and full high school and primary and secondary professional education establishments. - Trough with transparent walls 1 piece. - Converging lens 2 pieces. - Divergent lens 1 piece. - Polaroid film 2 pieces. - Flat mirror 1 piece. - Transparent flat semi-cylinder 1 piece. - Transparent plate with oblique sides 1 piece. - Plate with the letter "Г" 1 piece. - Screen with slot 1 piece. - Lamp with a cap 1 piece. 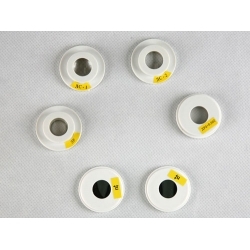 - Holder for optical elements 3 pieces. - Plastic mat 1 piece. - Pin with a round head 4 pieces. - Sheet with marking 1 piece. 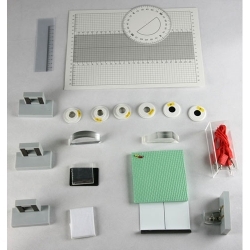 - Ruler on a translucent base 1 piece. - Connecting wires 2 pieces. - User manual 1 copy. - Packing box 1 piece. - Size of the basis of an element 35x70 mm. - Focal length of converging lens CL-1 60 mm. - Focal length of converging lens CL-2 25 mm. - Focal length of divergent lens 25 mm. - Period of gitter 0,002 mm (500 pieces / mm). 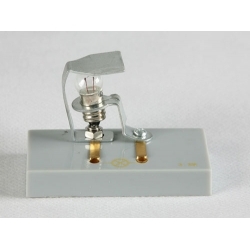 - Lamp 3.5 V, current of 0.25 A. - Parameters of refraction of a transparent elements material 1,48.